Eltex will present Eltex EYE yarn fault detection system for tufting machines at ITMA 2019 expo, in hall 4, stand B104. The world’s leading international textile and garment technology exhibition will be held from June 20-26, 2019, in Barcelona, Spain. Eltex is the leading provider of yarn break sensors and yarn tension monitors headquartered in Sweden. Beta testing of the latest advanced version of the Eltex EYE yarn fault detection system for tufting machines is currently underway at the plant of a major high end carpet manufacturer in the USA. “The latest advanced tufting machines put significant limitations on the space that is available for yarn fault detection systems, and the Eltex EYE is very comprehensive, with each yarn individually controlled for a 100 per cent detection of every tufting yarn break and end out. Unlike scanning inspection systems, we are monitoring each individual yarn position in real time. As a consequence, we have concentrated on the further miniaturisation of our sensors. Our sensors are usually fitted between the feed rollers and the needles and based on the well proven piezoelectric principle. Their special compact design already enables them to be fitted on machines with gauges as dense as a tenth of an inch,” Brian Hicks, managing director of Eltex of Sweden, the developer of the technology said in a company press release. All of the data from the sensors is processed by a master control unit which provides stop and warning light indications to the extremely user-friendly operator terminal in response to any detected yarn fault. 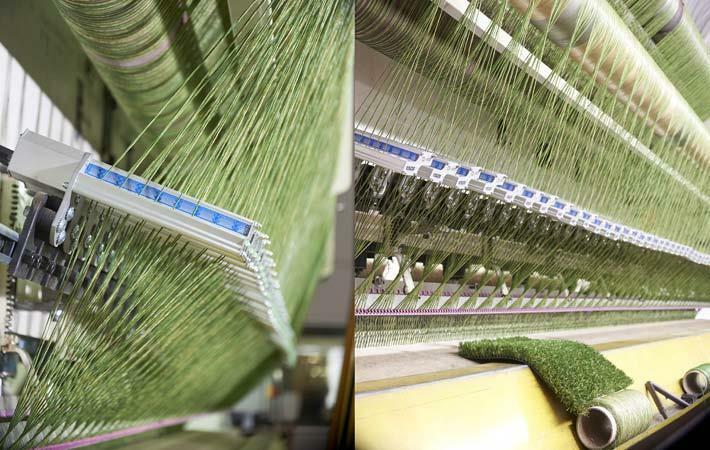 Eltex reports major gains with its first generation Eltex EYE in the carpet and artificial grass manufacturing sectors in recent years. The US remains the world’s epicentre for carpet tufting and Eltex customers are served there from the company’s wholly-owned subsidiary in South Carolina. Western Europe, however, still has a strong manufacturing base, particularly in Belgium, Denmark, Germany, the Netherlands, and the UK, while Turkey dominates in woven carpets.